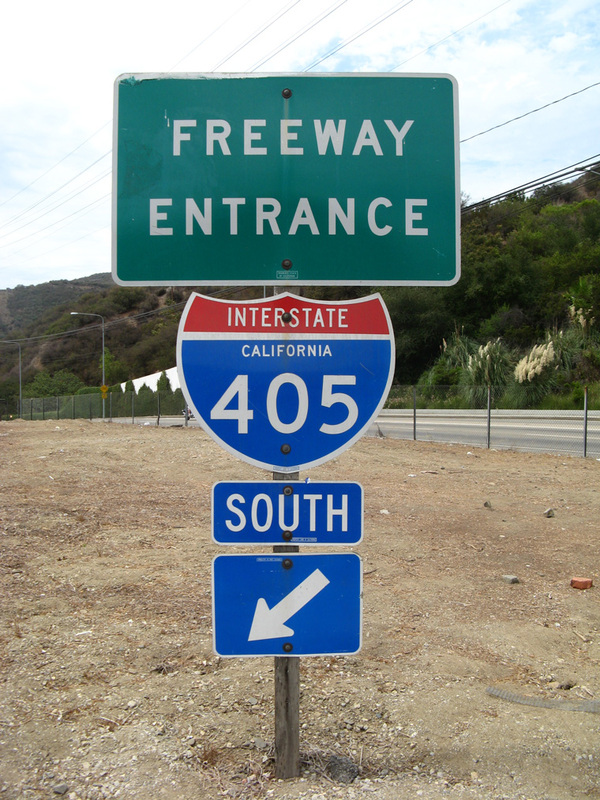 Interstate 405 (San Diego Freeway) within the four level interchange at I-10 (Santa Monica Freeway) in Los Angeles. Photo taken 05/31/15. 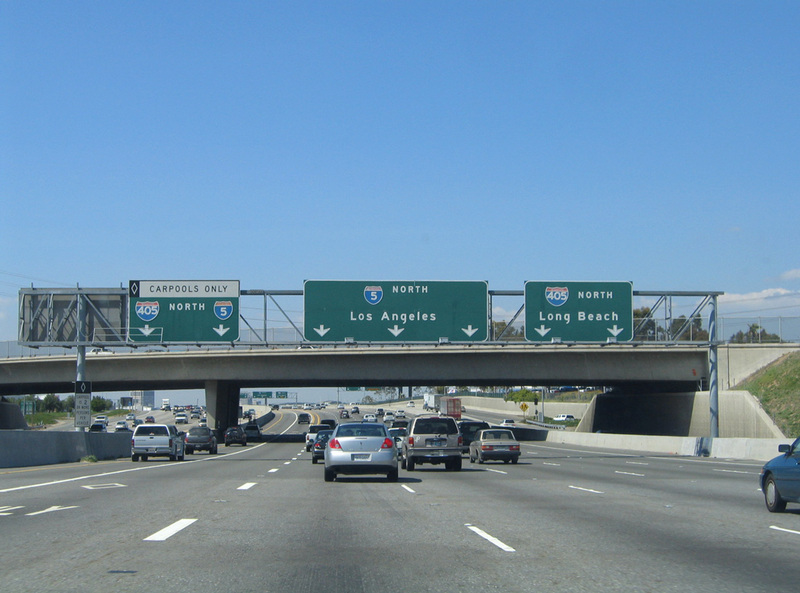 Following the San Diego Freeway, Interstate 405 is a major highway linking the northern and southern parts of the greater Los Angeles metropolitan area between the San Fernando Valley and Orange County. 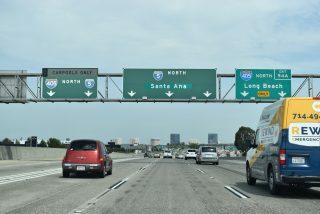 Always busy, at all hours of the day or night, I-405 is the most direct route between San Diego and Northern California. Additionally, it serves Los Angeles International Airport (LAX) and a number of coastal cities including Costa Mesa, Huntington Beach, Long Beach and Santa Monica. 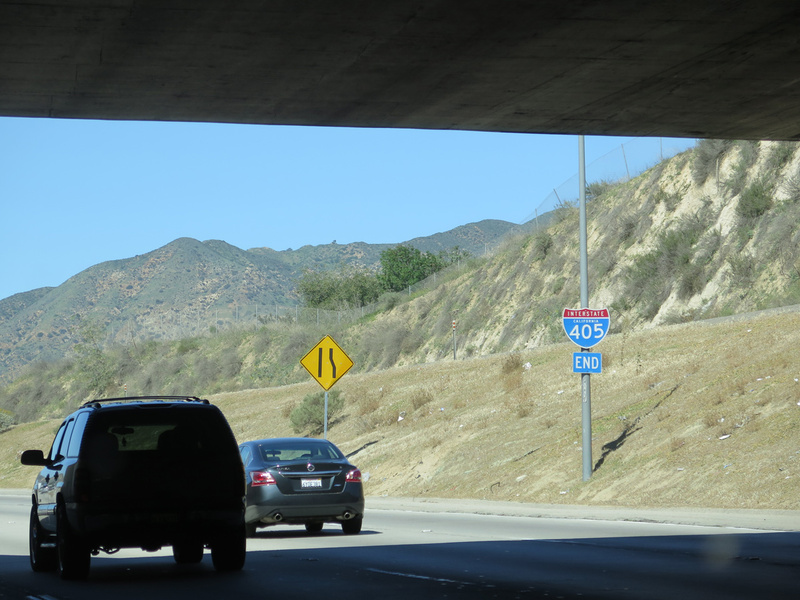 Heading north through Sepulveda Pass, Interstate 405 (San Diego Freeway) passes under Mulholland Drive by the Skirball Cultural Center. 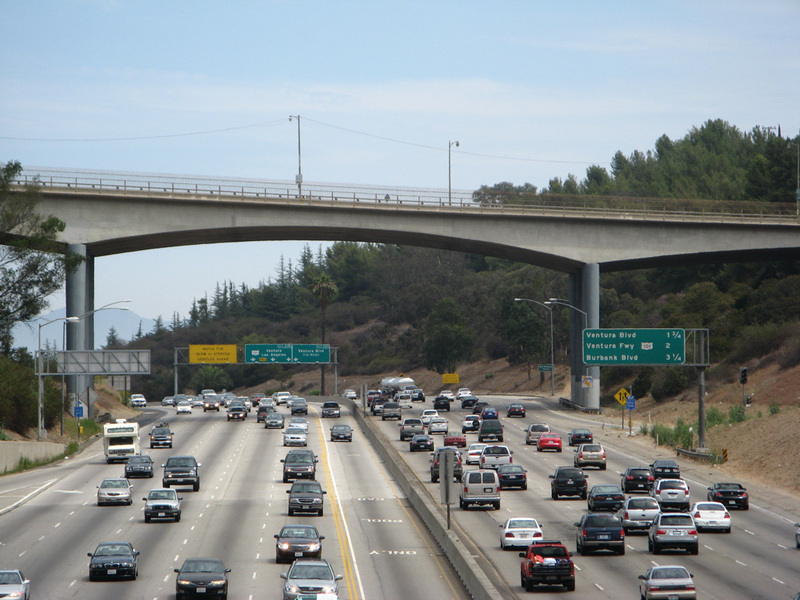 Construction in 2011-13 replaced this arched concrete span with an expanded bridge. 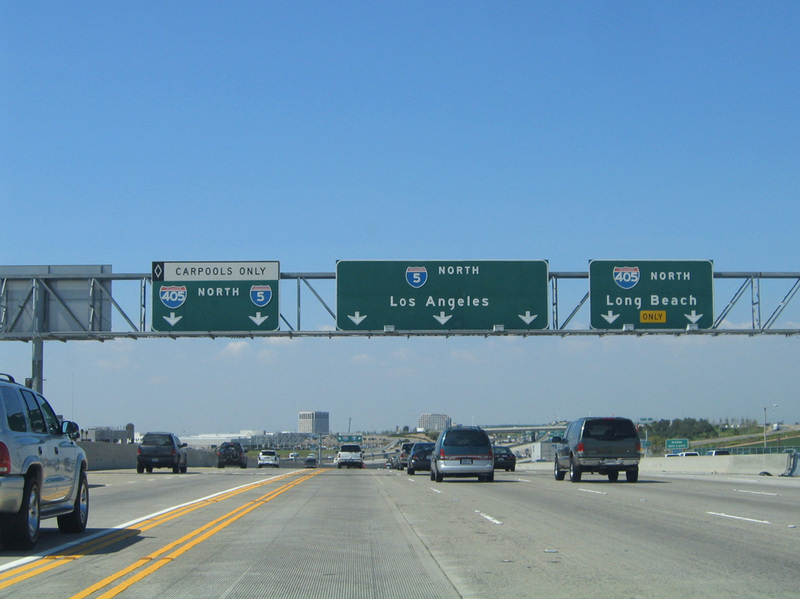 Photo taken 08/26/07. 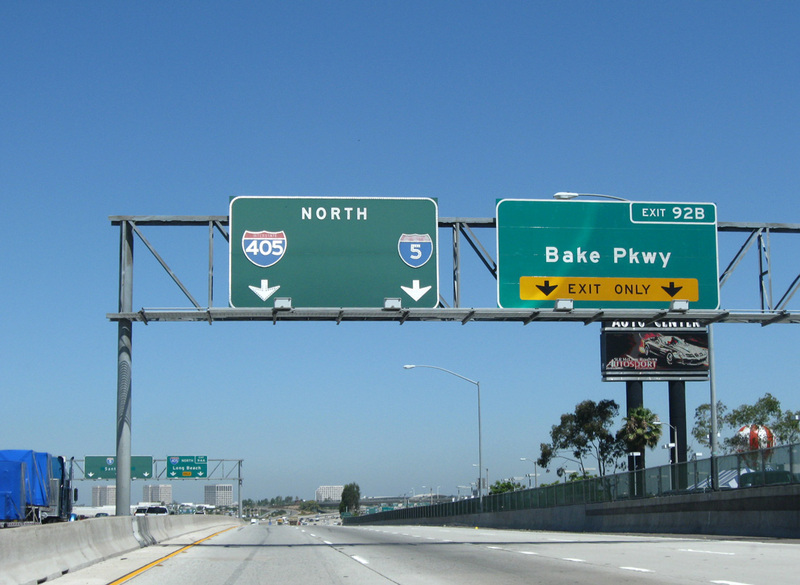 Interstate 405 defaults onto I-5 north after the modified diamond interchange (Exit 72) with Rinaldi Street at the Mission Hills community in Los Angeles. Photo taken 03/06/15. 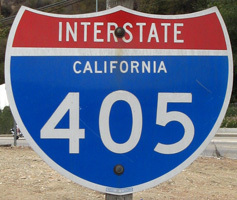 The final confirming marker for Interstate 405 northbound. 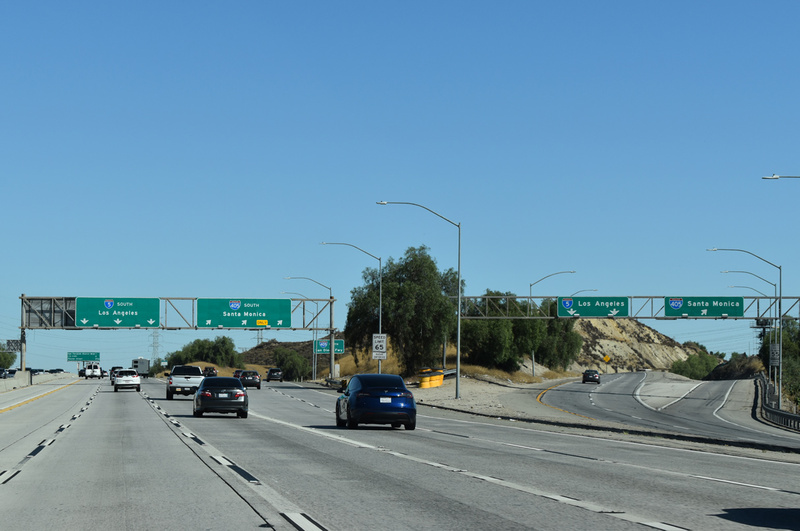 The San Diego Freeway converges with the Golden State Freeway (I-5) east of Lower Van Norman Lake. Photo taken 03/06/15. 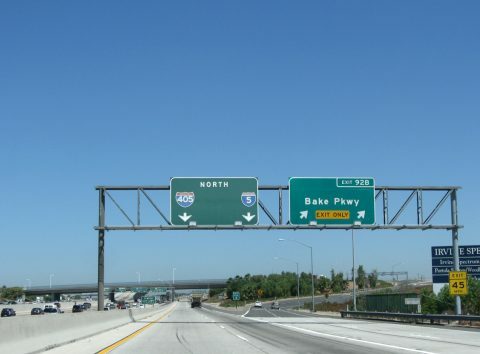 The northbound lanes of I-405 merge with the Truck Bypass lanes of I-5 beyond a tunnel below the Golden State Freeway mainline. 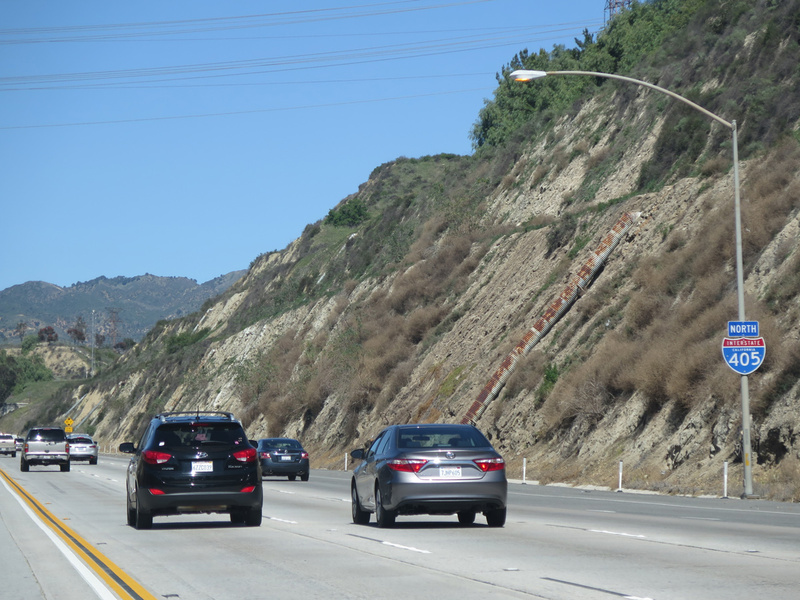 Photo taken 03/06/15. An end shield formally concludes Interstate 405 (San Diego Freeway) in San Fernando Valley. Photo taken 03/06/15. Interstate 5 separates with a truck bypass through the wye interchange at the north end of I-405. 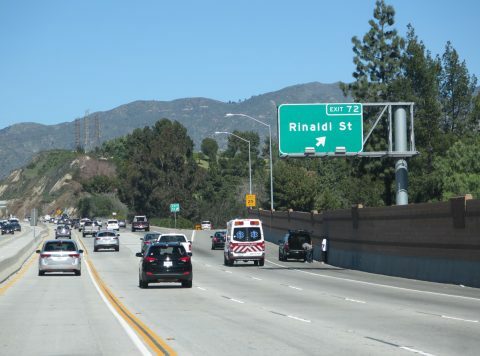 The outside roadway returns to I-5 ahead of the exchange with Interstate 210 (Foothill Freeway). Photo taken 07/07/15. 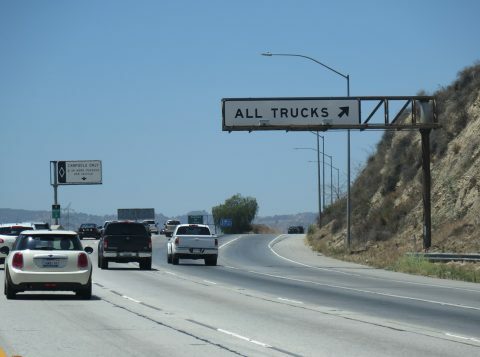 The truck bypass concept is fairly common in Southern California. In addition to the truck bypass with I-405 at Irvine, others on I-5 are located at the splits with both SR 14 and SR 99. 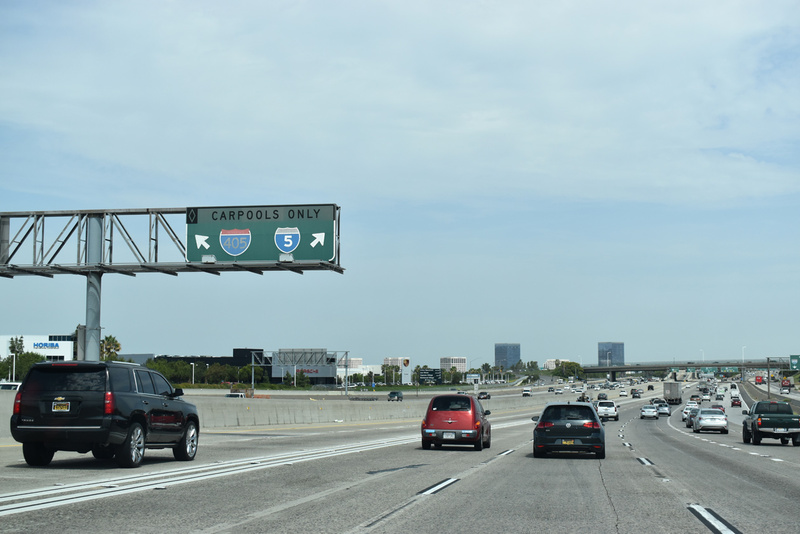 Photo taken 07/07/15. Replaced by Fall 2016, this porcelain enamel interchange sequence sign outlined the succeeding ramps along I-5 southbound for Roxford Street (Exit 159), the truck bypass for I-5 and 405 and the San Diego Freeway mainline at Exit 158. Photo taken 07/07/13. The parclo interchange (Exit 159) with Roxford Street for the Sylmar neighborhood in San Fernando Valley lies one mile ahead of the southbound I-5/405 split. Photo taken 07/07/13. 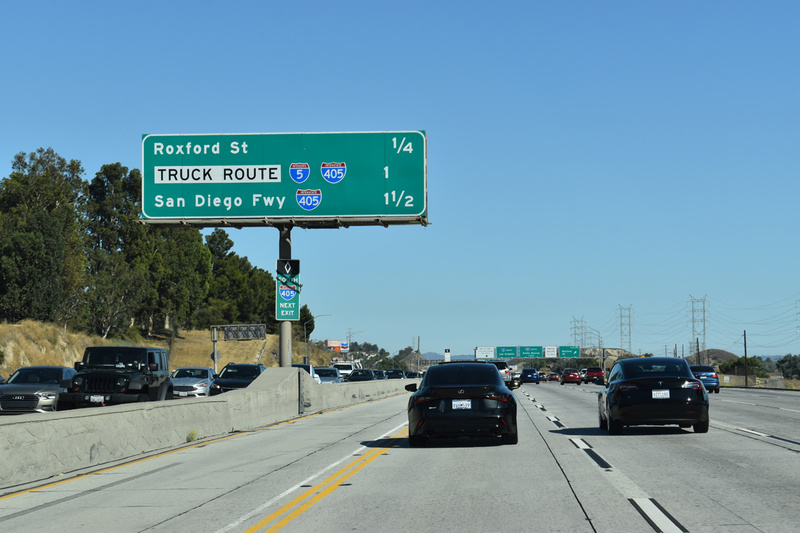 The truck bypass lanes depart from Interstate 5 one half mile before the wye interchange (Exit 158) with I-405 (San Diego Freeway). Photo taken 07/07/13. 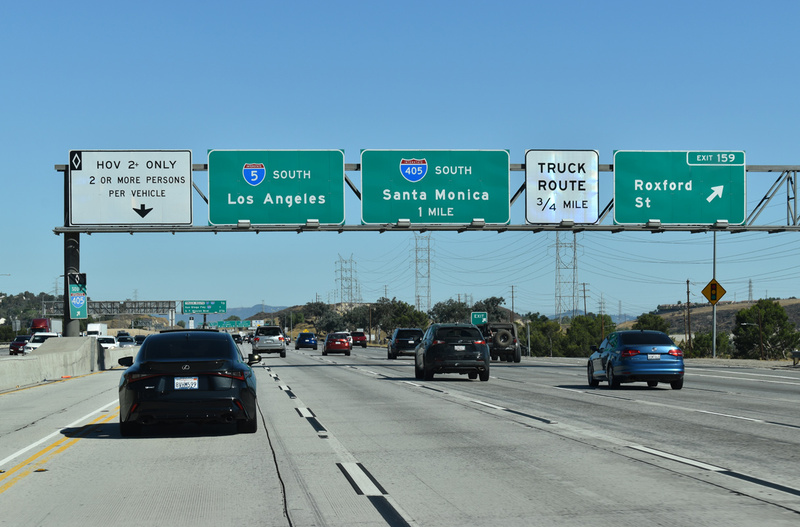 Interstate 5 continues south with three lanes plus an HOV lane toward Burbank, Glendale, Downtown Los Angeles, Norwalk and Orange County. 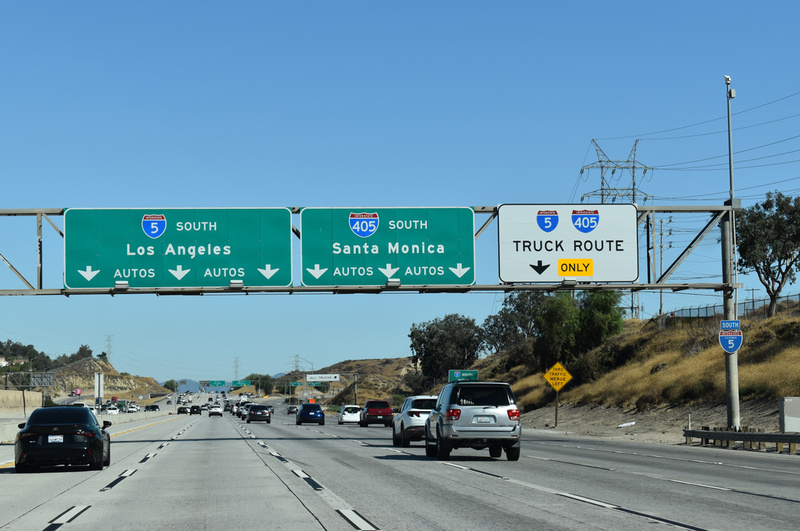 Interstate 405 (San Diego Freeway) skirts the western edge of Los Angeles, traversing the Santa Monica Mountains south to Santa Monica, Los Angeles International Airport (LAX), Long Beach and Irvine. Photos taken 07/07/13. 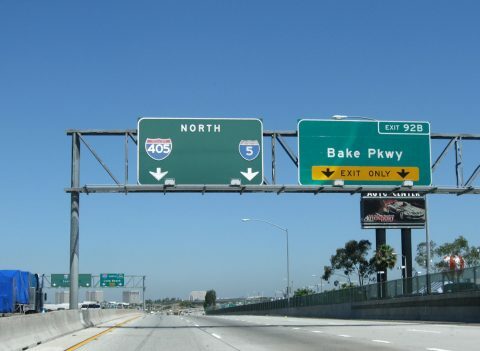 Exit 1B to Bake Parkway extends south along the commercialized west side of Interstate 5 (Santa Ana Freeway) to Bake Parkway. 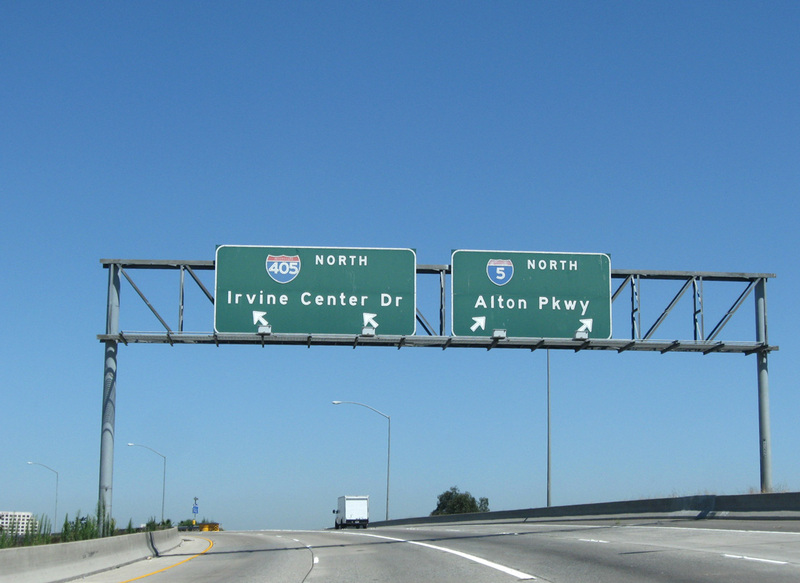 Interstate 405 (San Diego Freeway) converges with I-5 at a wye interchange in one half mile. 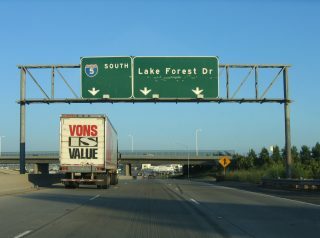 Photo taken 06/17/06. A slip ramp (Exit 1A) to the I-5 southbound truck lanes for Lake Forest Drive follows the exit for Bake Parkway. 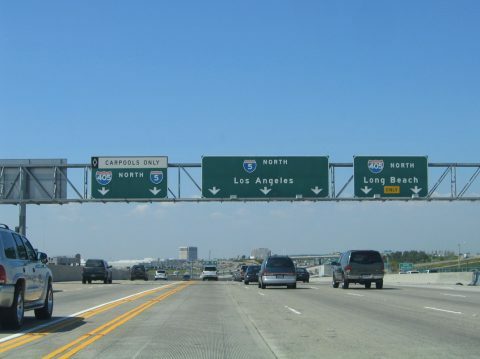 Photo taken 06/17/06. The elevated HOV lanes linking I-405 and I-5 appear beyond the separation of Exit 1A for the I-5 Truck Bypass lanes to Lake Forest Drive at the Irvine and Lake Forest city line. Photo taken 05/05/12. 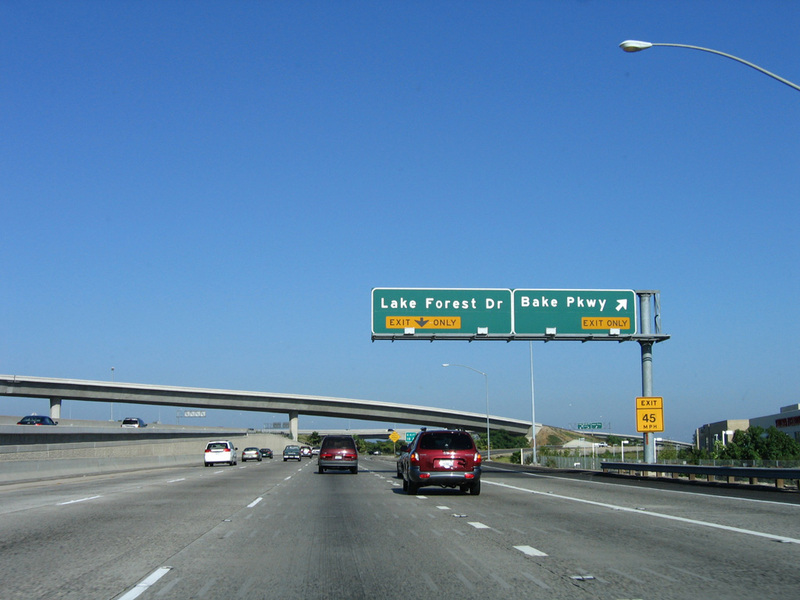 Interstate 405 south merges with southbound I-5 ahead of the Truck Bypass lanes and the parclo interchange with Lake Forest Drive. 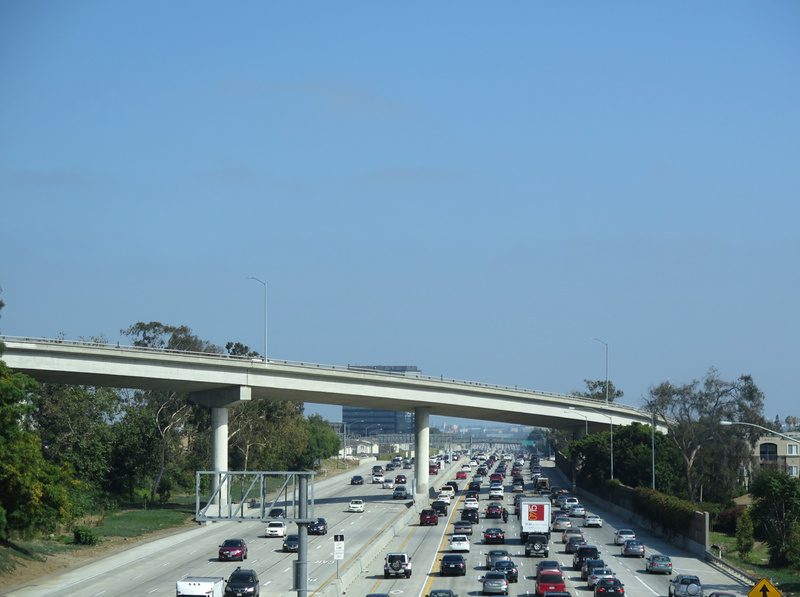 During peak hour traffic, this interchange is often congested. 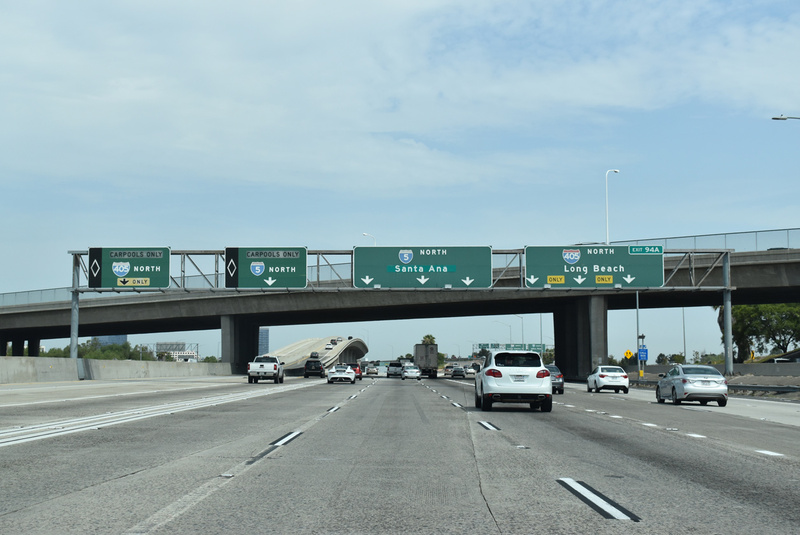 Photos taken 05/31/15 and 07/03/05. 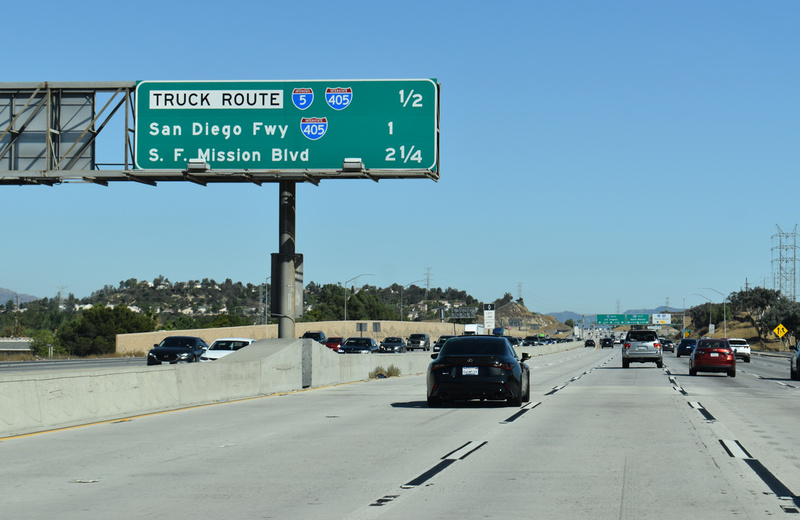 Travelers along Interstate 5 (San Diego Freeway) northbound may use the high occupancy vehicle (HOV) lanes, the main lanes, or truck lanes to connect with I-405 north at Exit 94A. Photo taken 07/09/18. Leading directly toward Downtown Los Angeles, I-5 will transition onto the Santa Ana Freeway. 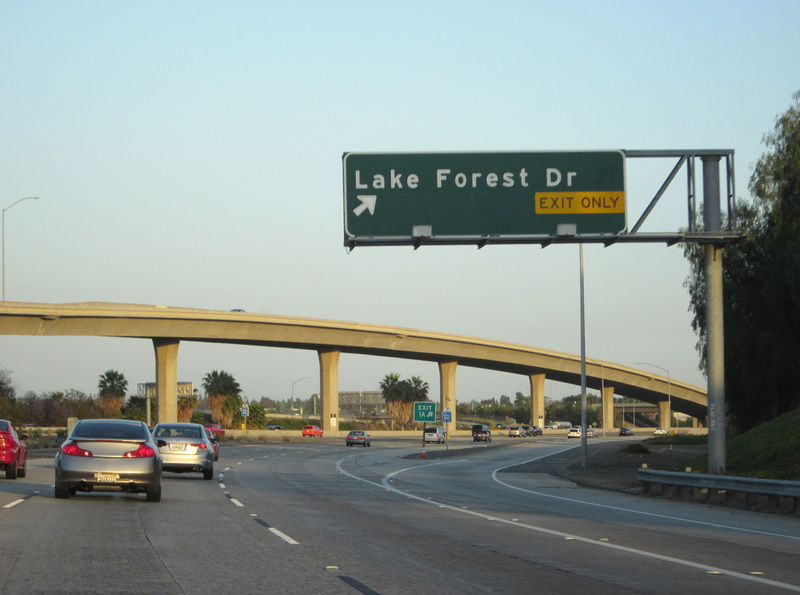 The San Diego Freeway branches west from I-5 along Interstate 405 to Long Beach and Los Angeles International Airport (LAX) before rejoining Interstate 5 in the San Fernando Valley. Photo taken 07/09/18. 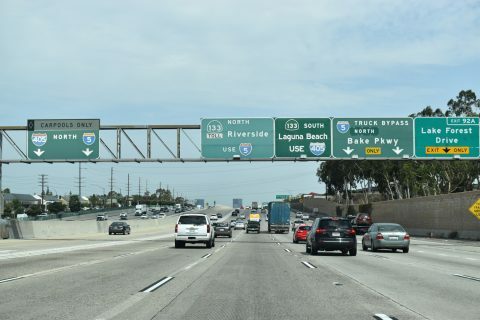 The HOV lanes separate for I-5 north to Santa Ana and I-405 (San Diego Freeway) north to Long Beach ahead of Exit 94A from the general travel lanes. Photo taken 07/09/18. 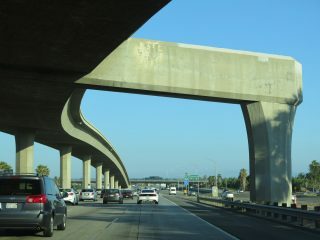 A single lane flyover partitions from the I-5 HOV lanes for I-405 through Irvine. 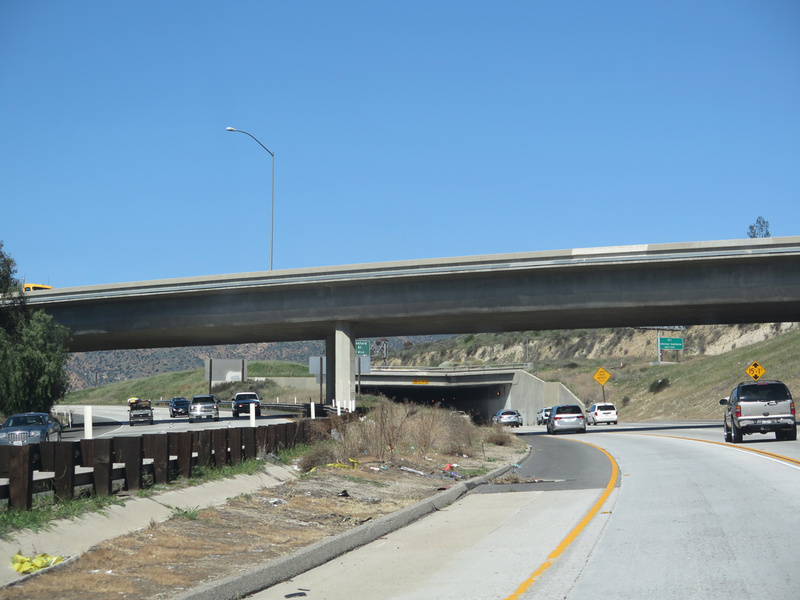 The total number of lanes at this wye interchange exceeds 20. Photo taken 07/09/18. 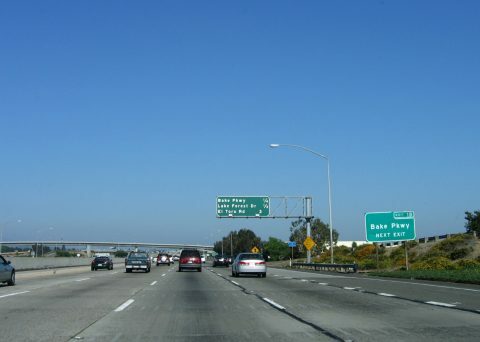 Exit 94A departs Interstate 5 northbound with three lanes for I-405 (San Diego Freeway) to Fountain Valley, Westminster and Seal Beach in Orange County. 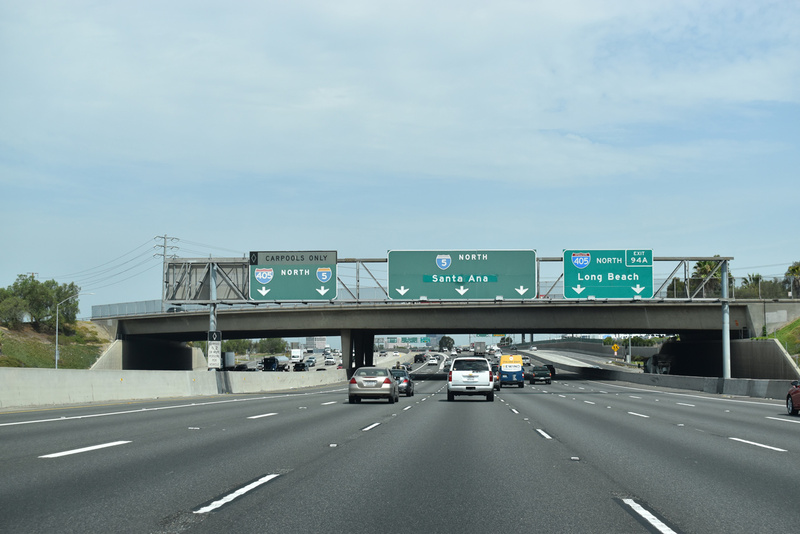 The Santa Ana Freeway leads I-5 northwest to Tustin, Santa Ana and Anaheim. Photo taken 07/09/18. Four lanes lead north along the I-5 Truck Bypass roadway from Lake Forest Drive to the parclo A2 interchange with Bake Parkway. 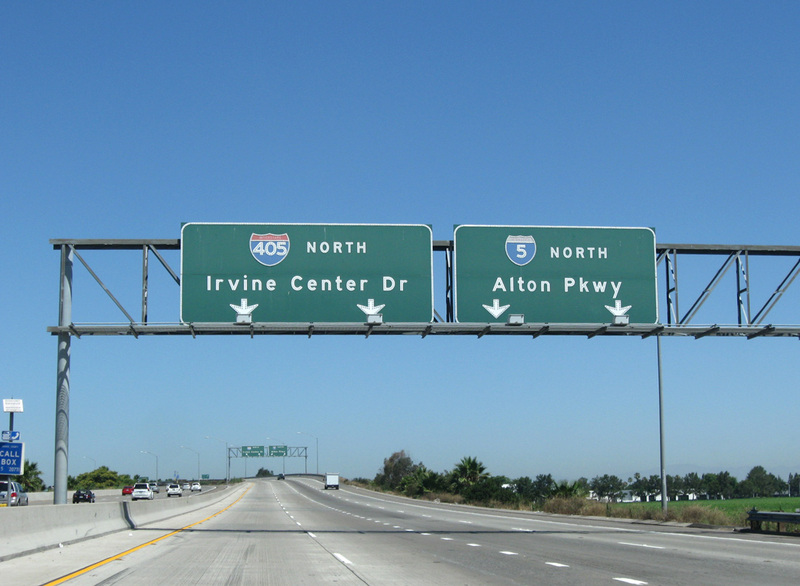 A left exit for Interstate 405 (San Diego Freeway) follows. 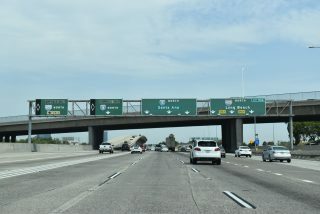 Photos taken 07/13/09. 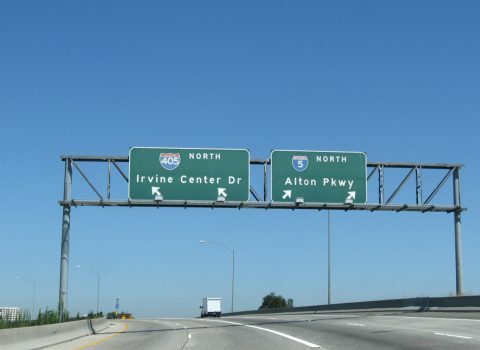 Advancing north from the Bake Parkway off-ramp, the truck bypass lanes partition with two lanes for I-405 north and Irvine Center Drive and two lanes for I-5 (Santa Ana Freeway) ahead of Alton Parkway in Irvine. Photo taken 07/13/09. The bridge separation for I-405 north from the truck bypass lanes dates back to 1968 as part of the original wye interchange between the two freeways. Photo taken 07/13/09. 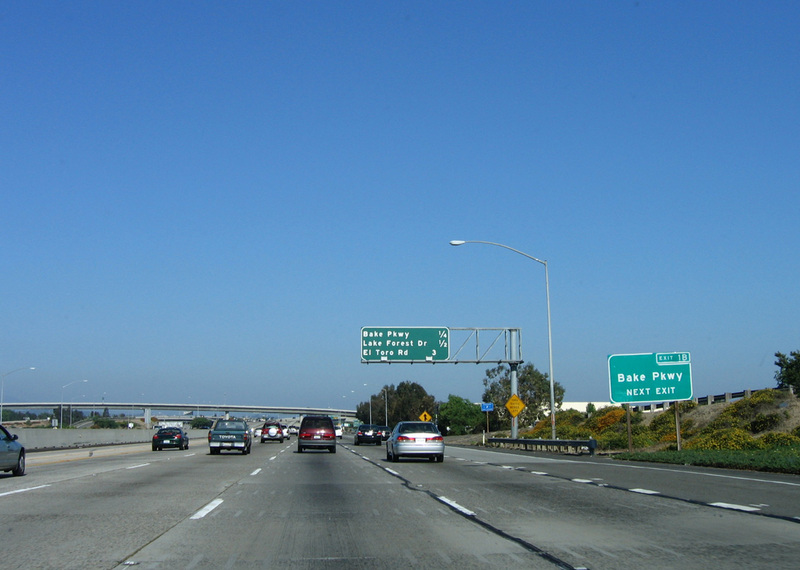 I-5 north at the separation with I-405 prior to the addition of exit numbers for the San Diego Freeway. Photos taken 03/25/05. 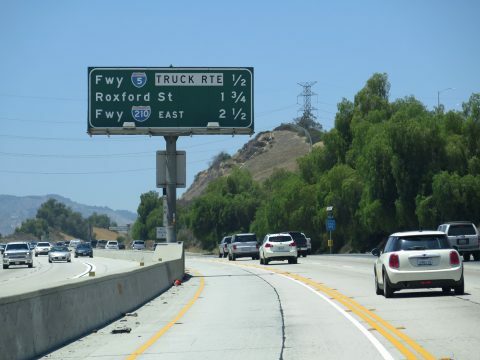 California Highways (cahighways.org): Routes 305 through 440. Page updated March 5, 2019.